September 11th, 2005: Cool, windy, and cloudy for the most part but some sunny periods - at least it didn’t rain today. Early Saturday morning it rained with thunder and almost non-stop lightning. By morning there was 1.5 inches in the gauge. At coffee, I learned there was serious hail around the Perigord area. 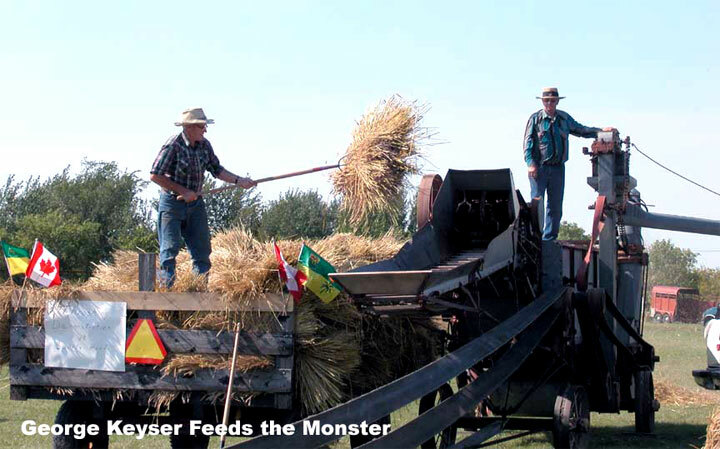 Riel Bossé reported about 1.75 inches of rain; swaths floating away and equipment standing in water. Later on, I talked to Len Teale who said the High Tor area got four inches of rain! 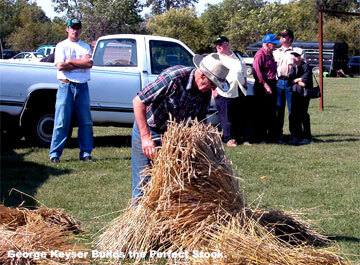 It rained off and on all day Saturday resulting in another quarter inch by Sunday morning. Our neighbours chose Saturday to re-shingle their house; I don’t think they enjoyed it! Wasn’t That a Party?!!! We spent last weekend at Wynyard, enjoying their homecoming celebrations and having a ball. We stayed at Grimson’s rather than taking the motor home down; Cathy and Freckles met us there, and Cathy rode back and forth into Wynyard with us while Freckles stayed at the farm and fought happily with Spike, Grimson’s dog. 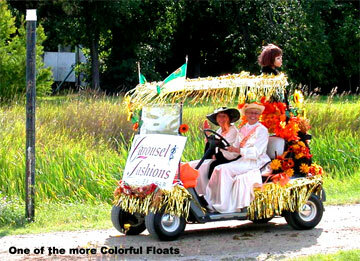 We hadn’t even thought of going until Linda Karakochuk phoned and asked us to ride on the Lilydale float. It was a beauty; a live-haul B-train divided into four sections for the four stages of Lilydale’s life - Crawford’s Foods, from 1958 until 1979; Plains Poultry until 1991; Sunnyland Sales until the late ‘nineties, and Lilydale since then. 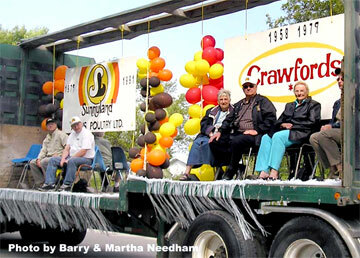 There were seven of us sitting under the Crawfords crest - Linda, Doreen, Cathy and myself on one side, and Frances Peterson, Jean Gudmundson and Gerry Moshurchak on the other. Each of the other three had people who had worked during that period as well. It was beautifully decorated, and we had a wonderful time, waving to people along the way and trying to spot those we knew. 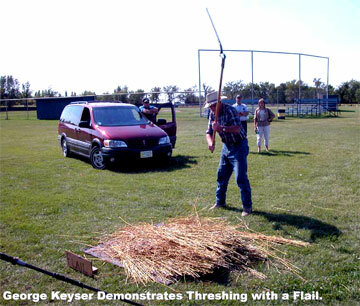 There was a threshing and stooking demonstration; George Keyser started it off showing us how the old flail worked but nobody else wanted to try it. George also wound up on the end of the shovel feeding the threshing machine - he is at least as old as I am, and as fit and strong as I would have liked to be at twenty. We had two plant tours - Lilydale’s plant first. I hadn’t been in the old plant since 1979 and about all I recognised were the shackles and a fork lift truck! There were about twenty-five in our group and I couldn’t always hear Brenda, our guide, so just had to guess at the various processes. When we were there, almost everyone used a knife; Brenda says that now there is so much automation that there are very few knives used. I was very impressed with the cleanliness of the plant and enjoyed the tour thoroughly. The Big Quill Resources plant is located on the shore of Big Quill Lake near where the cottage development of the late ‘fifties used to be. It uses lake water in one of its processes, making fertilizer. We were the last tour group and there were only four of us so we could stay close to our guide, Dan Christensen, hear him well, and ask lots of questions. When we signed up for our tours, I noticed that there was a lot of interest in the soya bean processing plant, which is the old Vis-à-vis plant right on the highway. 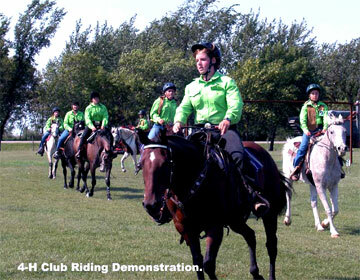 The people showed up for their tour, dozens of them, but nobody showed up to take us through! I guess public relations were not very high on their priority list. 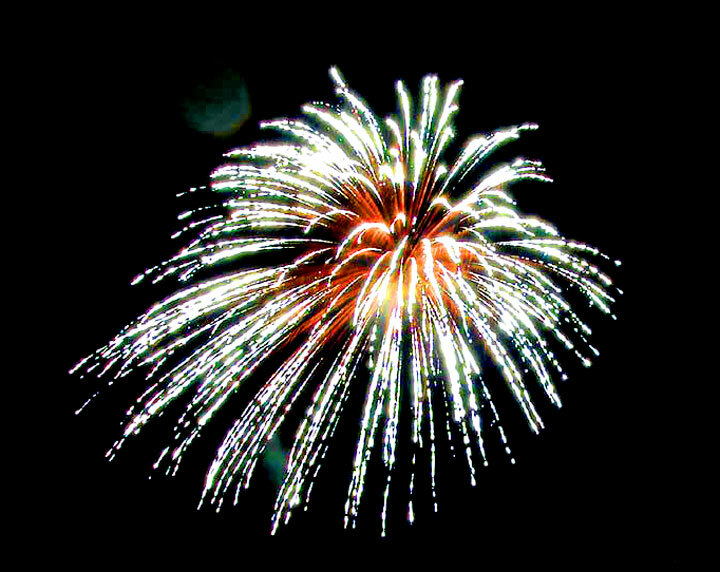 We had a great supper Sunday night, a talent show that packed the Civic Center Auditorium, then a very good fireworks display at the sports ground. Lots of entertainment, but the very best part for all of us was the visiting with people we knew from ‘way back then; friends, acquaintances, people who used to work with us, and people we met for the first time. I won’t even try to list them all. Once in awhile, I get weary of trying to get a column ready every week; then I go to a place like Wynyard where almost everyone I talk to says “Great column! Keep it up!” and then I know why I do it!